D'Artagnan saved the queen but lost his three friends and the woman that he loves. What has become of the famed trio: Athos, Porthos, and Aramis? Who could have captured the beautiful Constance Bonacieux? It is up to d'Artagnan to find out. 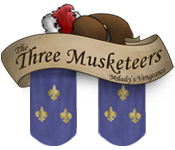 D'Artagnan's actions will soon capture the attention of femme fatale Milady de Winter, and lead to another adventure in The Three Musketeers: Milady's Vengeance, a fun Adventure game.